Chad Pollitt, a decorated veteran of Operation Iraqi Freedom and former US Army Commander, is the Co-founder of Relevance, the world's first and only website dedicated to content promotion, news and insights. ​He’s also an Adjunct Professor of Internet Marketing at the Indiana University Kelley School of Business and an Adjunct Instructor of Content Marketing at the Rutgers University Business School. 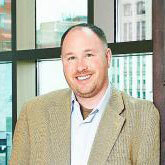 Chad is a member of the Advisory Board for native advertising platforms, inPowered and AdHive. All while delivering tens of millions of dollars of tracked return on SEO alone. In addition, he's driven over 100,000 leads and 24,000 marketing qualified leads in less than 10 years. Named a top five content marketing thought leader and top 20 CMO influencer, he continues to innovate by leading the emerging industry of online content promotion and distribution. Is Facebook Throttling Major Publications on Mobile? Did LinkedIn Ban Writers from Outbound Linking or is it Just Me? Finding Out Her Content Marketing Was Dying Was Beyond Devastating. So She Did THIS...You'll Need Tissues. Getting Penalized by Google: An Enterprise SEO Blessing in Disguise?